Speaker of the House of Commons John Bercow said the parliament’s rules dictate that MPs can’t be asked to vote repeatedly on the same motion. THE SPEAKER OF the House of Commons has said Prime Minister Theresa May cannot have another meaningful vote on the Brexit deal without changes. John Bercow said MPs from both sides of the house had expressed concern to him about the house being asked to vote repeatedly on the “same fundamental proposition”. He said the parliament’s rules state that a motion or amendment that is the same in substance as one that has already been decided by the House can not be brought forward again in that same session. 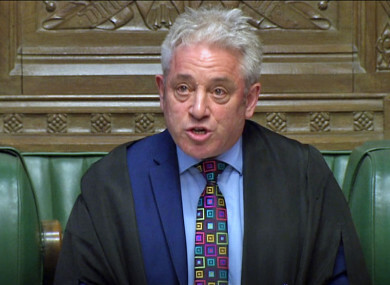 Bercow told the House of Commons that he is of the opinion that the second meaningful vote on the deal, which took place on 12 March, was not in breach of this rule. He said it could be “credibly argued” that it was a different proposition as it contained a number of legal changes that the government considered to be binding and that were agreed with the European Union. However he added that the government can not now submit “the same proposition or substantially the same proposition” as was rejected on 12 March by 149 votes. He said it must be “fundamentally different”. Not different in terms of wording, different in terms of substance. This is in the context of a negotiation with others, outside the United Kingdom.That would be my initial feeling. Theresa May had been expected to call a third meaningful vote this week but this is now unlikely to happen. Bercow said this was not his final word on the matter. He said it was designed to signal to the government what will be required. Email “Theresa May cannot have another vote on Brexit deal without changes ”. Feedback on “Theresa May cannot have another vote on Brexit deal without changes ”.